Way back in 1923 the No. 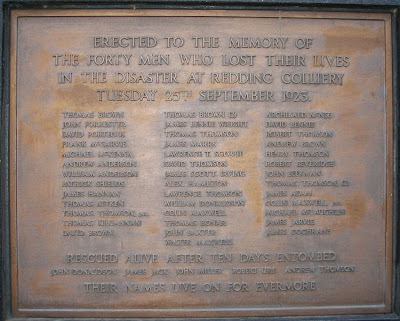 23 pit of the Redding Colliery flooded due to the insuffient safety planning by the Colliery management, the concerns of the actual miners seemingly not being conveyed to those in control. 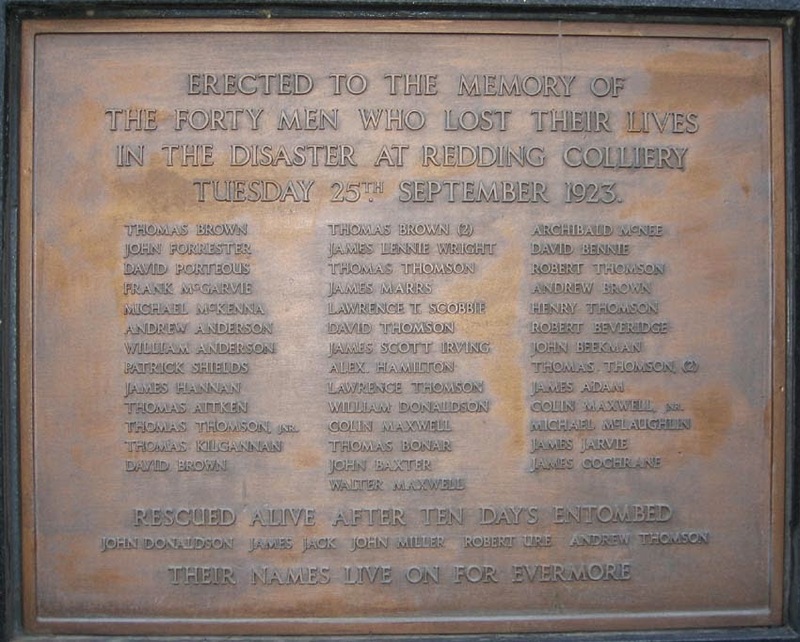 After rescue attempts the bodies of forty men were recovered from the pit, who are commemorated at Redding Cross. The disaster obviously cast a shadow upon Falkirk District [then the local economy was based around heavy industry], that this affected almost everyone in the area almost goes without saying, and without adequate social security it fell upon the community [never the employers] to come to the aid of the afflicted. Back in the 1920s 'football' was a far greater part of the community than it is now [not a criticism, just an observation], so the local clubs played their part in the fundraising, and while I am not saying that they were at the forefront of the benefit fund, they were certainly there. The main thrust of the local clubs' efforts came in the form of a one off tournament under the auspices of the Stirlingshire FA, it was in effect an extra Stirlingshire Cup, but with proceeds going to the benefit fund. Like the previous extra Stirlingshire Competition in 1902 it was treated in a sort of "take it or leave it" fashion, so with teams scratching not all of the fixtures were fulfilled. This time it was the Semi-Finals which suffered from lack of matches. T.Ferguson; T.Scott & James Hunter; T.Glancy, T.Townsley & R.Dougal; R.Bryce & John Hunter, S.Puddefoot, J.Gourlay & W.Moore. White [Hearts]; McNair [Celtic] & McQueen [Airdrie]; Steele [Hamilton Ac], Gillespie [QP] & McMullan [Partick Th]; Archibald [Rangers] & Rankin [Motherwell], Gallacher [Airdrieonians], Gallacher [Celtic] & Lawson [Rangers]. Note- I just made up the name of the competition [I always go descriptive] I have never found a proper title for it. In the aftermath of the Ibrox disaster nearly all of Scottish Football pulled together in aid of the benevolent fund and the Stirlingshire Association did their bit along with the others. A while back I wrote a weepost about the tournament at the start of the 1902/03 season, which was in effect an extra Stirlingshire Cup, the proceeds going to the fund. But before that there was a match played at the tail end of the 1901/02 Season for the same cause. On Tuesday 15th April 1902 at Merchiston Park [the home of East Stirlingshire FC] the Stirlingshire FA organised two representative teams for a challenge match. Unlike previous matches this was not played by a Stirlingshire XI against a large club or another representative team, instead the sides were chosen along the lines of Town v County, in other words Falkirk against the Rest of Stirlingshire. Besides the football entertainment was provided by the Carron Works, the Wright Memorial and the Falkirk Burgh Brass Bands, and a there was a "very large attendance of spectators". On the field the Town side wore the Black & White of East Stirlingshire, while County wore Red Jerseys and White shorts. Town - Allan [FFC]; Hill [FFC] & Gillespie [FAFC]; Scott [FFC], Fish [ESFC] & Rae [ESFC]; Low [FFC] & Kellock [FFC], Leishman [FFC], Dobbie [ESFC] & White [ESFC]. County - McCrory [KPFC], Leishman [CFC] & McLeod [SFC]; Reid [CFC], McBride [SFC] & Campbell [CFC]; McNair [SFC] & Clarkson [SFC], Baird [SFC], Carrigan [CFC] & Rae [CFC]. The match itself was very competitive, although I suppose the tackling was less intense than in a more competitive fixture, and was very end to end. The first side to strike was County, who on the counter attack passed the ball to Baird who hit the leather so hard that Allan could not hold on to to it and let it slip over the line. However within three minutes Town had equalised, scorer missing. For the rest of the half County were on the ascendancy but the Town defence stood form. Half Time 1-1. Within three minutes of the resumption Town's Centre-Forward Robert Leishman nipped in behind his wee brother William Leishman on the County side to sent Town into the lead. After some exciting goalmouth skirmishes at both ends Baird again put the teams level. But almost straight from the kick-off Dobbie took a long shot that slipped between McCrory's hands and put Town back ahead. For most of the remaining time play was camped in the Town half, but this time William Allan was on the form that was to become common for the next two decades between the sticks. Failing light brought the players off some ten minutes before the scheduled 45 minutes had been played; the result standing Town 3 County 2. The gate reciepts were reported as £18 6s 1d, but collections made in the ground added to the sum to be given over to the Ibrox Fund. This is the last time that I have come across a representative Falkirk [geographical] side, but I dare say that were one to compete against the County today an FFC/ESFC XI could have a decent tussle against a SAFC/SFC XI, but I am a hopless romantic and think such matches are the best way to play Benefits, Testimonials & Charity matches, far better than the same two clubs who might have played several times within the last year. I live in hope. In 1902 the Stirlingshire FA organised a seperate Competition on the same lines as the Stirlingshire Cup, It seems to have been in part to celebrate the Coronation, however the proceeds were given to the Ibrox Disaster Fund. I have never found an official name for this competition, so I made up the name above. The ccup was rather hastily arranged, so the first round was a bit of a disaster, only two games taking place, both between Alloa Athletic & Falkirk, both draws leading Falkirk to withdraw [we had just joined the League and had more important fixtures to fulfill], in the other ties King's Park scratched to East Stirlingshire and Falkirk Amateurs scratched to Stenhousemuir. At least the Semi-Finals were competed, with East Stirlingshire beating Camelon by a single goal and Stenhousemuir beating Alloa by 3-1 in Alloa. So for the the big [semi] local final, naw, it was a drab affair by all accounts, ESFC again winning by the only goal of the match, but then again that it is all it takes. So, in the summing up of all mankind at the end of times, at least ESFC will be able to meet their maker in the eye and say "We were the one and only winner of the Stirlingshire Coronation Tournament" [or whatever it was officially called]. I have put the results on Brian McColl's brilliant Scottish Football Historical Archive site. Falkirk - Rae; Kerr & Malcolm; Logan, Cochrane & Johnston; Stark & Donnelly, Sneddon, Murphy & Another. East Stirlingshire - McMartin; Ritchie & M.Harley; Reid, Kadie & R.Stewart; Kirkwood & Simpson, Dunn, T.Harley & Gardner. Camelon - R.Stewart; A.Fraser & W.Webster; J.Ramsay, D.Inglis & W.Burns; Jas.Scott & J.Brown, H.Fraser, T.White & J.Wilkie.